As with any historical project, the Digital Newspaper Program sometimes takes on the character of detective work. Here’s an example from the past week in the office. 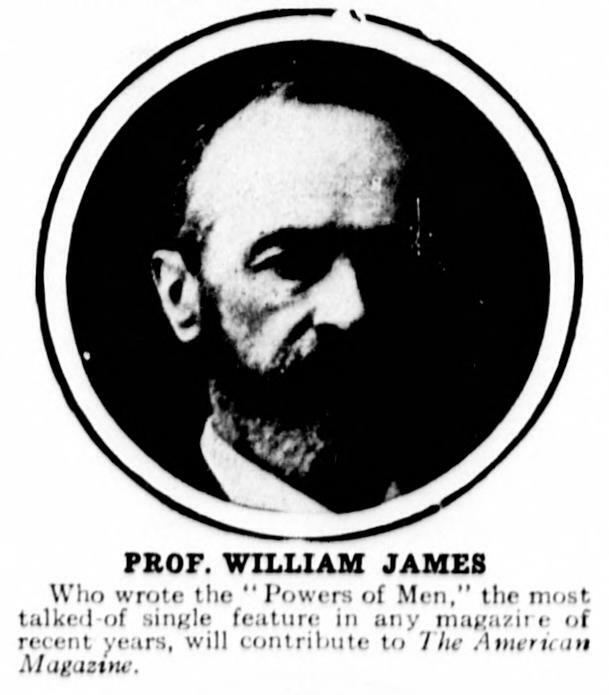 While John didn’t immediately recognize “The Powers of Men”–the “most talked of” article by James cited in the photo caption–he thought it was probably an alternate title for James’ famous work, “The Energies of Men.” I started doing a little research to confirm this, and quickly determined that John was almost certainly correct. However, a new problem now came to light: the date of the Willamette Farmer issue this came from was April 20, 1883… yet all the bibliographic sources I was finding indicated the article’s date of publication as 1907. We were suddenly facing a mystery of rather overt anachronism. In search of an explanation, I referenced our collation records for the paper in question. The records listed this issue as ten pages; the Farmer was usually published as eight pages. The two extra pages–including the one with Prof. James on it–were notated as a ‘special advertising section.’ No date, issue or volume number were recorded on these pages.